Last night, I was at the CaveHenricks Books & Bytes party at SXSW 2011 in Austin TX with Barbara Cave-Henricks, Rusty Shelton and a host of people who love books: people who write books, who write and talk about books, people who publish books, above all, people who care about books. Some of the discussion was along the lines of: “I like the smell of old books,” as Peter Georgescu, Chairman Emeritus, Young & Rubicam wrote recently. There’s nothing like the experience of a physical book. 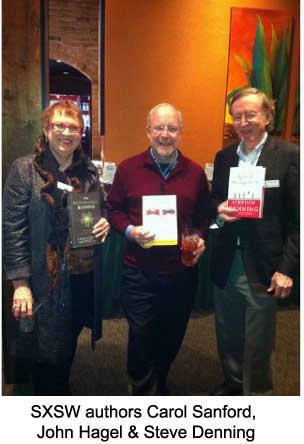 For example, last night, Carol Sanford was clutching the first physical copies of her new book, The Responsible Corporation: Reimagining Sustainable and Success, like a baby. Carol is “on a mission to create a better world, and she believes that business can and will play a major role in accomplishing that. It’s more than just a responsibility program. Responsibility will be in the DNA of the business and everyone will participate to make a real difference.” Having the physical book in hand helps make the vision real. When you think of someone reading a wonderful substantive book on a Kindle or an iPad, wouldn’t it be seductive to be able to digress, and listen to an aside by the author, what he or she was thinking when this passage was written, or a conversation with one of the participants, or a set of dazzling pictures of what was under discussion? Who would be able to resist this seduction? Isn’t this ultimately what John Hagel, co-author of the path-breaking book, The Power of Pull (2010), was really talking about when he foreshadowed the end of the era of pushing products and services at customers, and manufacturing demand, and the beginning of a new era in which the winners will be those who can can “pull” people into a different world and interact with them. It’s a world focused on outcomes rather than outputs; on relationships rather than transactions; on people rather than things. If the new kinds of books can make the future more understandable, more transparent, more accessible, bring it on! Thank you very much for the extensive explanation. I with you completely agree. How amazing is that. Kudos to all developers.